Sep Hibiscus Coast Cricket Club Open Day! Hibiscus Coast Cricket Club are very proud of these young men and young woman, who performed outstandingly to end in second place in the White Cross ACA District and Club of Origin T20 u15 Boys tournament, showing signs of future greatness for our club and beyond. 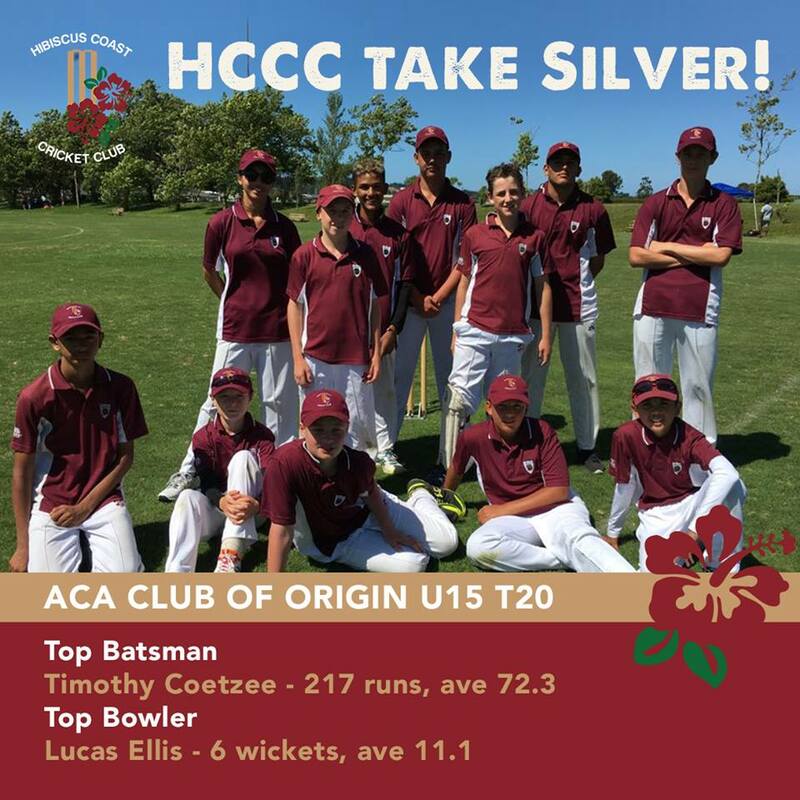 The HCCC Club of Origin u15 team, cruised to the finals of T20 competition, winning three of their four group matches (including smashing a monstrous 251/5 off 20 overs vs Kumeu) on their way to the semi-finals. That match they played against East Coast Bays, and winning, by posting another imposing score of 166/3 before taking all 10 wickets for 142. The 4 game winnings streak set up a final between HCCC and Auckland University CC (the only unbeaten team). Batting first AUCC managed to restrict HCCC to 104/8 from their 20 overs, and the match ended with Auckland University getting the runs in the 17th over. HCCC were prolific in their run scoring with 4 players ending up in the Top 10 Batsmen in the tournament. Timothy Coetzee ending 2nd overall with 217 runs, and Blake Murphy 3rd with 163 runs. Lucas Ellis ended with 9th most runs, but was also HCCC’s top wicket taker with 6 wickets at an average of 11.1. Making him the second best all-rounder of the tournament.